What does this tell us? 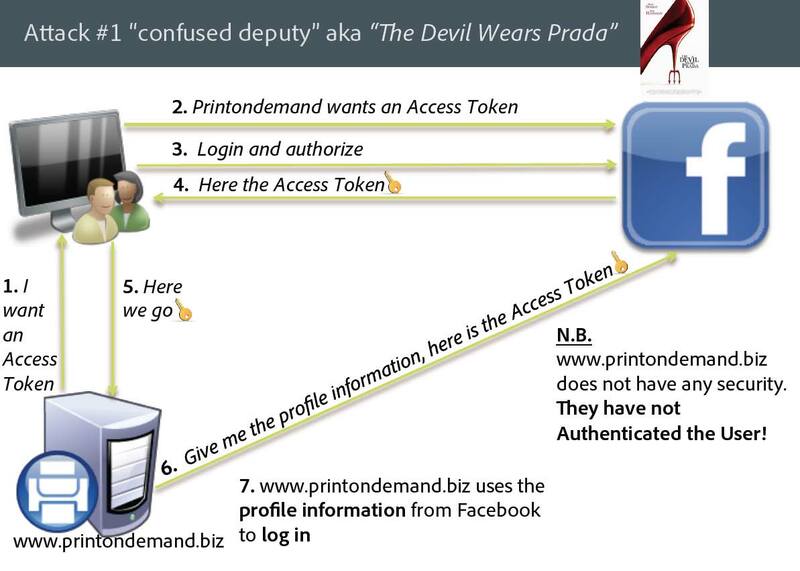 That www.printondemand.biz authenticates, given an Access Token. 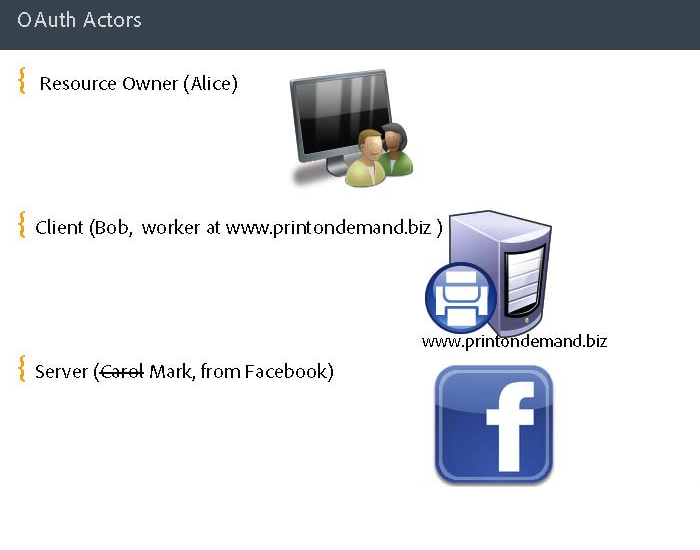 Now let's see how we can use this information to "our" (from the attacker point of view) advantage. So, referring to the image above, after point 6, Alice got from www.dosomething.biz what he requested. At this point Alice is out of the game. www.dosomething.biz owns an Access Token from Alice though. 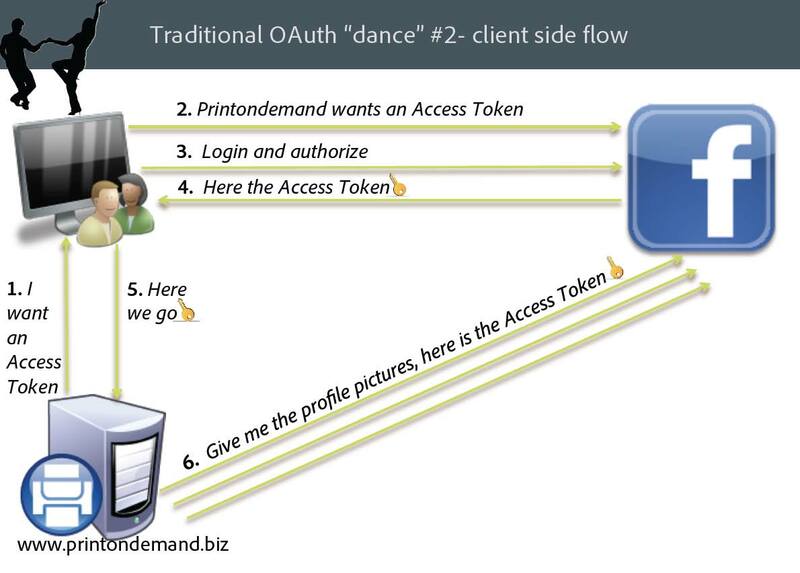 What www.dosomething.biz can do is to give this Access Token to www.printondemand.biz. And which one is the outcome? You have guessed it, right? How nice :) www.printondemand.biz just authenticated www.dosomething.biz as Alice!!!! 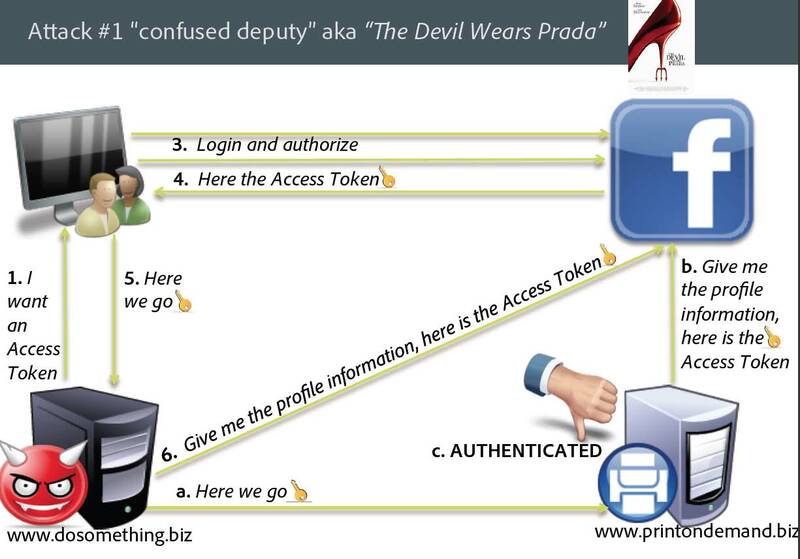 To be noticed that this attack came from something that the RO kind of trusted, hence I named it "The Devil Wears Prada". At this point you might wonder which one is the mitigation for this attack. 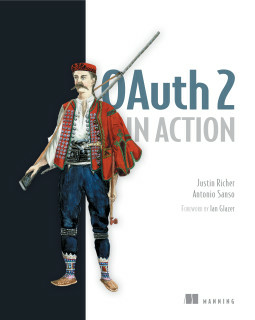 There are several but the best that comes in my mind is to use OpenId Connect for authentication. 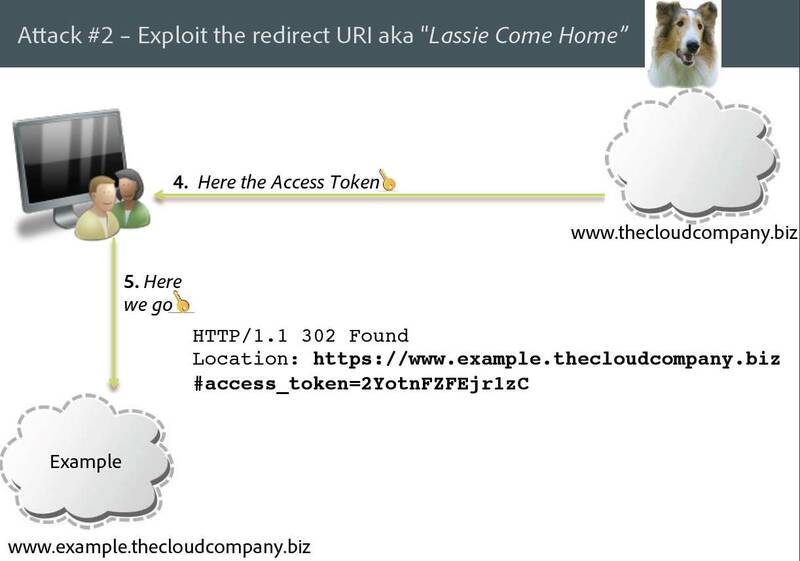 The famous www.thecloudcompany.biz offers the possibility to register your own client. One of the client of www.thecloudcompany.biz (named example) is one departement of www.thecloudcompany.biz itself. This clients runs under the domain of www.example.thecloudcompany.biz. Above you can see a normal client side flow. Following the image above let's assume that I (www.bad.com) have registered yet another client at thecloudcompany.biz. My client id is 'Bad' and ther registered redirect uri is www.bad.com. The next step to do is to create a link as per the image above and let the RO click on it. Guess where the RO Access Token ends up? If you answered www.bad.com kudos to you. 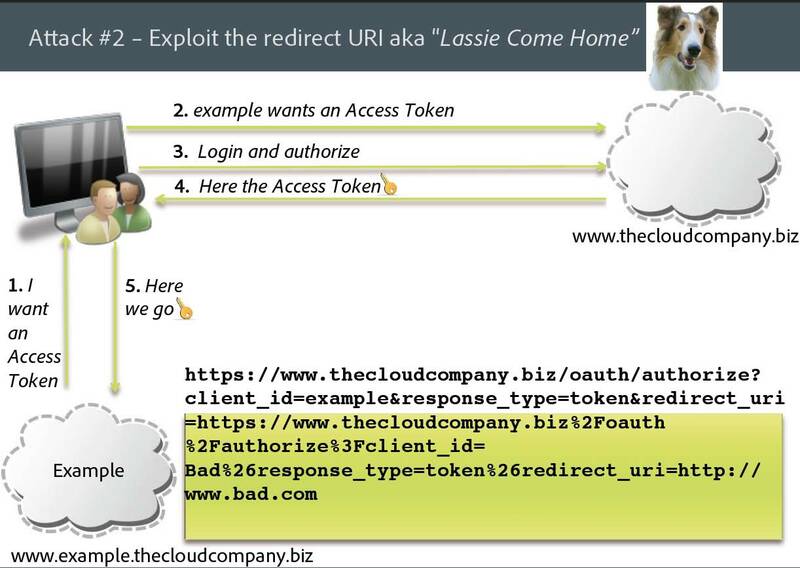 1. the registered redirect uri from the client 'example' is too loose so https://www.thecloudcompany.biz%2Foauth%2Fauthorize%3Fclient_id=Bad%26response_type=token%26redirect_uri=http://www.bad.com is a perfectly valid redirect uri!! At this stage you might also wonder why I named this attack 'Lassie come home' but I also hope you figured out the answer :).